2016 presidential campaign coverage: Suggestions for how the media should cover the candidates. 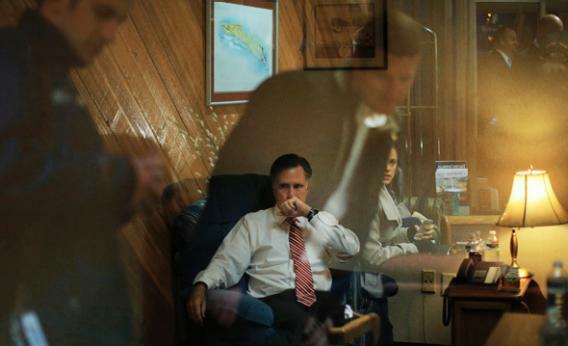 Staff members reflect off the window in a room where Republican presidential nominee Mitt Romney works before a campaign rally in North Canton, Ohio, on Oct. 26. In the 2016 presidential campaign there will be lots of unexpected twists, but one thing is certain: A lot of us are going to find the process frustrating and shallow. That is the trajectory of American elections, and it is getting worse. The rise of Twitter and other instantaneous forms of communication have made the news cycle shorter and its content less meaningful. Rising partisanship means more flash-point moments to excite the devoted but leave everyone else exhausted. Wait, maybe that’s too dark. We’re still a few years away from 2016. Perhaps we can forestall the great national wilting. Peter Hamby, the talented CNN political reporter, made a useful contribution to that effort. As a fellow for Harvard’s Shorenstein Center, Hamby wrote a detailed assessment of the campaign trail reporting for the 2012 presidential race. The nearly 100-page report is full of candid thoughts from reporters and strategists about the state of journalism on the campaign bus—that bubble of reporters who encircle the candidate every day. It captures a general empty feeling in the trade that something needs fixing. Everyone falls short in Hamby’s tale. Journalists are overstretched, their bosses have short attention spans, candidates and their staff are in a permanent defensive crouch. Twitter is the central villain, accelerating the worst instincts in political insulation. In the case of the Romney campaign, the reaction to the rise of Twitter was to become even more withdrawn from the press. Hamby doesn’t just peddle despair though. At the end of his report, he suggests ways reporters can improve by moving away from the quick, calorie-free controversy of the moment and focusing on topics like the science of voter contact and the role of money and PACs. He also gives a shout-out to my colleague David Weigel, who doesn’t fixate on the candidates as much as cover the political forces to which those candidates are reacting. I’d like to suggest another beat that deserves some attention: whether the candidates running have the skills required for the office they’re trying so hard to win. What would a presidential campaign look like if we tested candidates the same way? The first thing we’d have to do is figure out what skills a president actually needs. (I made a stab at this question last year in a series of articles.) Voters are already groping in this direction. As Washington grows more partisan, voters try to divine a candidate’s effectiveness. Partisans want their purity dreams to become true while those in the middle want a president who can be effective in an environment where everyone has taken sides and won’t budge. Voters wanted President Obama to put on Lyndon Johnson’s tights and cape to break the logjam in Washington. They didn’t know how. They just imagined that all presidents had the same superpower, and it was just a matter of using it. Four years earlier, they had wanted the same effectiveness but lunged for a different solution. Barack Obama was only a one-term senator and had no experience actually running anything, but voters bought his argument that through the force of his personality and earnest bipartisanship, he could pick the Washington lock. They were wrong on both counts. The myth of LBJ the superhero forgets that he was successful during a special time in American history. It also ignores that ultimately he was stymied, too. Plus, Obama had been elected as a kind of anti-LBJ: transparent, conciliatory, and untarnished by Washington’s backroom culture. It was unrealistic to think that he could become a completely different person, just as unrealistic as it was to think four years earlier that someone who had spent so little time in Washington and had such disdain for the political process could transform the entire operation. Unpacking the LBJ myth, what it says about what’s possible in the presidency, where Obama falls short, and what voters want could keep a reporter busy for weeks. The next task would be to measure the crop of candidates against the requirements of the modern presidency. What in their background suggests they have any of the relevant skills? Have they ever managed a group larger than their campaign staff? Have they ever had to translate their ideas into action, build a coalition, and rally people to a goal? What do the people they have worked with most closely say about their temperament under pressure? When did they compromise in a meaningful way? When did they refuse to budge? How do they respond to failure? What mistakes have they made, and what did they learn from them? As Hamby explains, asking these kinds of questions was one of the useful things about riding on the campaign bus covering a candidate day to day in the old days. You endured listening to the same stump speeches because between them you had time to talk to the candidate and his staff to take the measure of the candidate. There is no precise formula for greatness, of course, but if nothing else, this exercise teases out who the candidates are and provides a framework for examining their candidacy. Candidates will hate these questions because they’re complicated, but they can hardly duck them on the grounds that they are frivolous. They are the core issue. If they don’t talk, their friends and colleagues will. If it turns out there aren’t really answers to any of these questions in a candidate’s background, it might tell us something about the weakness of our candidates. The usual suggestion for improving our campaigns is to focus on the issues. That’s great, but any voter who wants to learn about the issues can read himself blind. (Voters usually don’t, but that’s their fault.) Sure, candidates should be more forthright about their plans, but in this past election, the policy choices were well-debated and aired. The question for the next set of candidates is not just what you believe and what you want to do, but what skills you have that suggest you will get any of that done. This probably sounds a little too dry to you. Fake exchanges of umbrage about the role of women in the workplace or seizing on a campaign aide’s clumsy reference to an Etch A Sketch does make for better jokes. Far be it from me to rob us all of a good laugh. Still, no one can keep giggling all through the day and hope to keep their jobs. Or at least it’s no basis for hiring the most powerful person in the world.